The quickest way to reach us by car is via the Tauern motorway A10 – exit St. Michael in Lungau. Your holiday destination is just 14km from the motorway. From St. Michael follow signs to Mauterndorf, then further towards Maria Pfarr. Enter Pichl 141, 5571 Mariapfarr in your GPS or Google Maps. 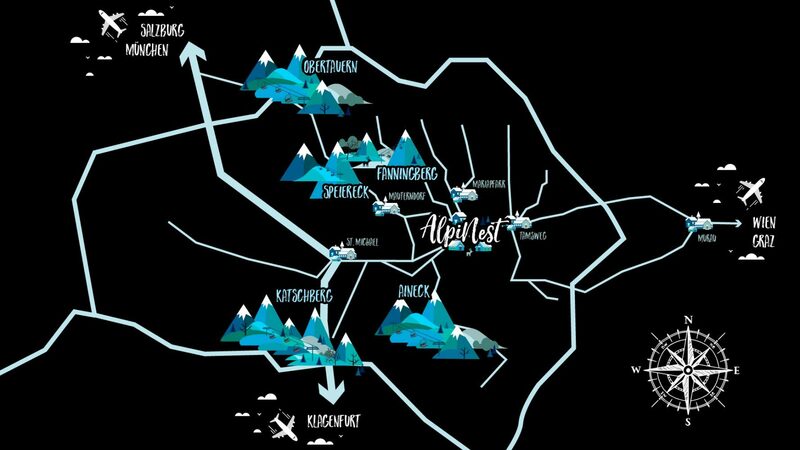 AlpiNest is centrally located – the centre of Austria and the centre of Lungau! Lungau is difficult if not impossible to reach by train. If you are coming from the south you can travel via Unzmarkt, Murau and finally to Tamsweg. The journey from Murau to Tamsweg is a nostalgic experience as you would take the Murtal train which was built in 1894. From all other directions your arrival point would have to be the train station in Radstadt in Pongau. From there you can get to AlpiNest by bus via Obertauern in Lungau. The nearest airport is Salzburg Flughafen W. A. Mozart. The airport is approx. 115km from AlpiNest. We would be happy to help you find the quickest route – simply contact us before your arrival.